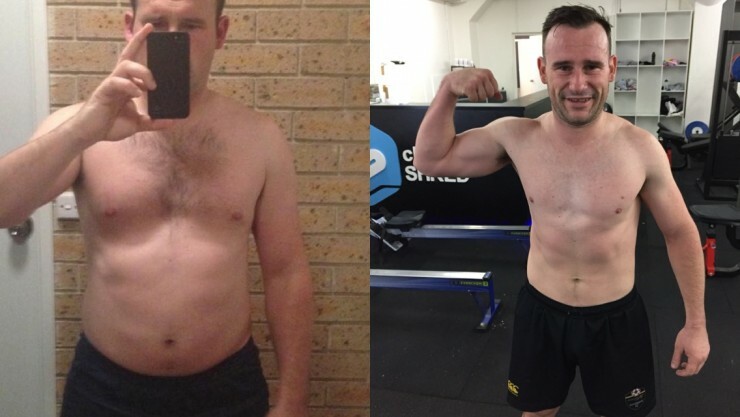 Troy has dropped over 15% body fat and lost 10kg. Troy has transformed from having poor energy and hating mornings to jumping out of bed excited about the day ahead. Read on to see how he did it..
Before Clean Shred I was stacking on the weight, I played football at a competitive level for a number of years before hanging up the boots at the end of 2013 to play Club football. Playing at a decent level kept me in shape, training twice a week and a game on the weekend. Once I finished up playing physical was non-existent and the unhealthy life kick into over drive. Deep Sleep protocol to help with getting to sleep earlier including wind down techniques and supplement stacks such as Gaba and Magnesium. Shred Team training in the morning getting his day off to a cracker start, not to mention the best training for gaining muscle and shredding fat. Nutrition – Nutrient dense eating plan to keep his dopamine levels high in the morning and seratonin levels up in the evening. Breakfast – starting his day with a high protein and fats breakfast meant he had more energy throughout the day. * Results may vary. Results are based on individual circumstances. Timeframes for results are not guaranteed. A positive attitude is required.